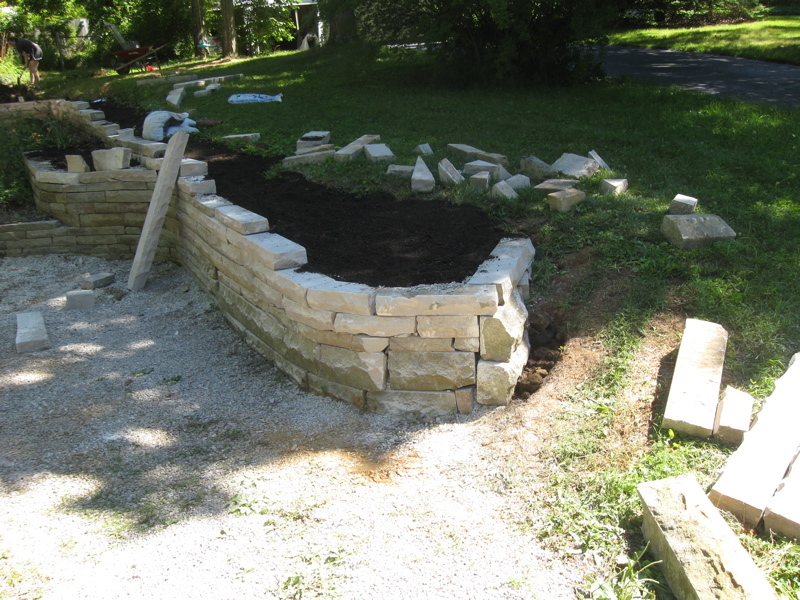 I spent last week reading, among other things, George Eliot on the sanctity of skilled manual labor (Adam Bede) while Sarah constructed a stone wall in our front yard. It was pretty funny. In the evenings we’d both be saying “Whoo! Long day! I’m tired!” but I was tired from sitting in the library/cafe turning pages slowly, reading about Adam and Seth building cabinets and coffins, Sarah from heaving big slabs of limestone, chipping at it with hammers, rearranging the dirt and gravel, etc. 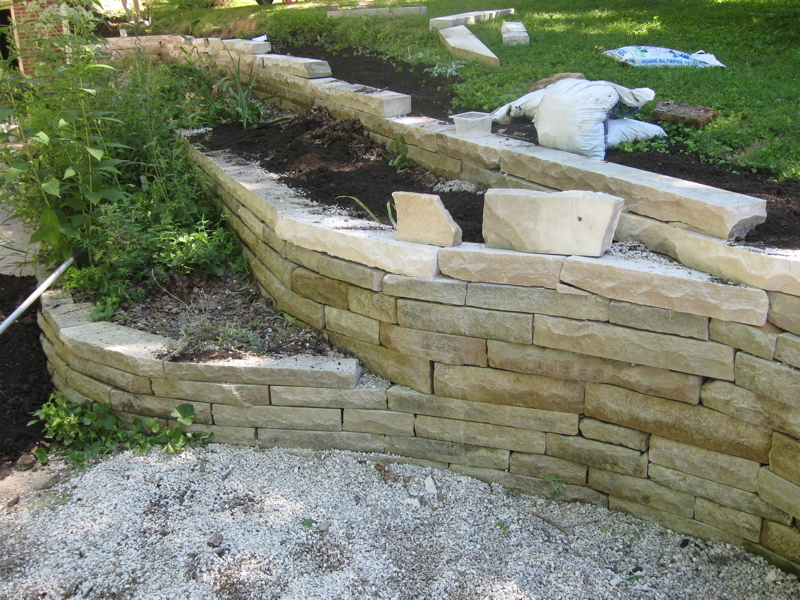 This is a “dry-laid” wall, meaning that it’s made without mortar, simply by fitting the pieces of limestone together neatly. Sarah and Jack bought four tons of limestone in the end, 1/2 ton at a time in a truckload. It costs $80 per ton (pretty good deal, $320 for all of this stone). The pieces were cut by saws with smooth edges, so they needed to be “split-faced” — chipped away with a carving tool — to make them look more natural. Yesterday I laid aside the Victorian fiction for the morning to help Sarah with some of the stone-lifting, digging, and root-cutting. It’s good exercise, my arms were tired afterward. She thinks that strenuous digging is the perfect exercise for psychological health, I think partly for evolutionary-biology-related reasons, and that instead of aerobics or step classes at the gym, people should just spend an hour digging dirt. Probably true. I asked her if she thought it was a fair estimate to say that I contributed 1% of the labor on the wall. She didn’t really dignify that with a response, but I think it’s about right. This is where Free-Masonry got started. Did you get to carve your initials in it? Or bury something wonderful in a cornerstone? You know how when the Spanish forced the Aztecs to build churches, they also had them decorate the facades with images of the Aztecs being enslaved by the Spanish and being forced to build churches? It would have been great if you’d added some folk art-style relief of pale figure in giant sun hat, forced to toil on wall, victorian literature tossed to one side. great idea… love the idea of me as oppressed indigenous people, toiling away (for one morning). I’ll definitely try to slip in some subversive stone-carving.